This tour of Phoenix and Scottsdale showcases the highlights of Arizona’s largest cities in the Sonoran Desert. During this small-group tour, you’ll get a sense of what these gems of the desert have to offer. Phoenix currently holds the title of fastest-growing city in the United States and boasts a tremendous diversity of culture, scenery and history. Meanwhile, Scottsdale, though a smaller neighboring city of Phoenix, showcases a vibrant downtown district full of local businesses and cultural centers. This Phoenix and Scottsdale small-group city tour offers amazing views of the entire Phoenix-Scottsdale region. Experience diversity of culture, scenery and history on display, set against the backdrop of the Sonoran Desert. 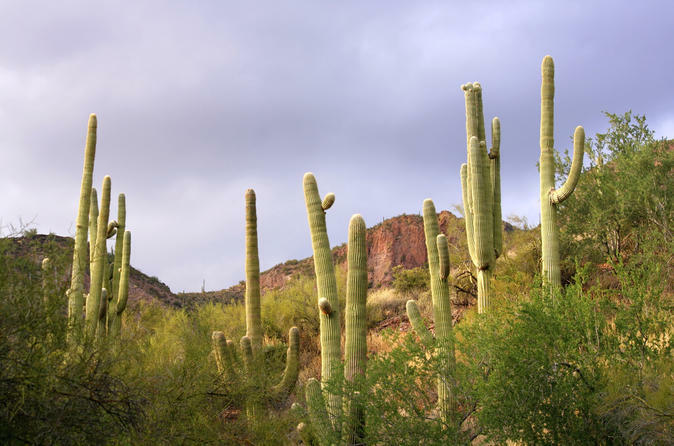 After pickup from your hotel, enjoy a drive through the Sonoran Desert and enjoy views of our various mountain ranges. Cruise through the Downtown Phoenix Corridor, home to the area’s skyscraper district, Arizona’s historic capital building and the sporting facilities for the Phoenix Suns and the Arizona Diamondbacks. Explore “The Jewel of the Desert”: The Arizona Biltmore Resort, famous for it’s architecture influenced by Frank Lloyd Wright. This is the only luxury hotel has been the preferred resort for past and present celebrities, heads of state, and champions of business. Venture through Old Town Scottsdale’s galleries and experience the area’s western charm as you explore the streets of "The West's Most Western Town." You will have some free time to visit the many art galleries and fashion shops, as well as enjoy some fine cuisine.